In Knockout stages generally we see very different approach from the teams as the end result matters a lot and the losing team always finds it very difficult to cope with after the match. Both the teams are still in the game and even though Delhi have the advantage, Goa can still turn it around as the lead is only by one goal and if they get their heads right they can win this. 15th December 2015 at 19:00 IST. Jawaharlal Nehru Stadium, Goa, India. The game was witnessed by 23,784 spectators at the Jawaharlal Nehru Stadium in Delhi, supporting both teams. Dynamos showed great character, totally not referring to a former Liverpool manager, as they won in front of their homes and showed what they are capable of. The game started off as Goa got their first free kick in the 5th minute and due to that Delhi got a counter and had their first shot. The first shot for Goa came in few minutes later as Lee Moura made a perfect ball for Joffre who provided a beautiful cross but Sabeeth was not able to keep his header on the target and the ball was very far from the goal. Delhi was dominating possession in the first half and making life miserable for Goa and their hard work finally paid off in the 42nd minute as Robin Singh scored a header off Chicago’s cross and gave his side the goal that was enough to see him off in the first leg. 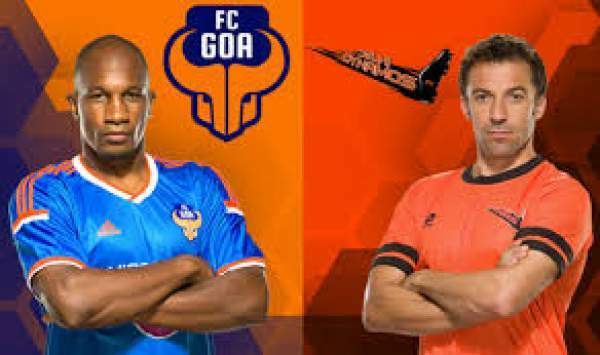 Dynamos had 57% as compared to FC Goa’s 43% and Delhi had 16 shots in total out of which 4 were on target as compared to Goa’s four shot out of which only one on target. It was a very interesting match as both the teams played good, but the only team could win and it was Delhi who came out on top and it is always the best team who always wins and, this time, Delhi played well. Goa was not their best today and lost the game, but anything can still happen today as only a 1 goal lead can be very easily overturned. Ghosh, Souvik, Ali, Riise, Robert, Vinicius, Greene, Malouda, Gauze, Nabi, Singh. Andrade, Halder, Lucio, Denson, Lucca, Bikramjit, Roy, Joffre, Desai, Dudu, Reinaldo. You can watch it live on Star Sports network and hot star. Return here after the match for the result, video highlights, complete / full scorecard, scoreboard and much more. Don’t forget to share it on social media sites to let others know. Stay tuned for more latest ISL news and updates.